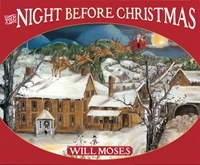 All of our books are personally signed by Will Moses. 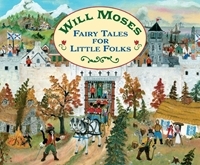 "Will Moses Fairy Tales For Little Folks "
Anyone longing to share these timeless, well-loved tales with a favorite child will welcome this enchanting collection from acclaimed folk artist Will Moses. 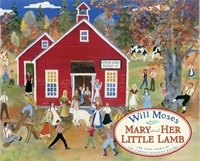 "Mary and Her Little Lamb"
A delightful, true story with loads of wonderful illustrations, Mary and Her Little Lamb will be a brilliant addition to the library of the little folks in your life. Well here is an old favorite that just about everyone has heard of. What a tradition Clement Moore began when he wrote this wonderful old poem. Growing up we always read "The Night Before Christmas" at Christmas time and today we still recite it faithfully every Christmas Eve with our kids. This version is a pretty nice book, even if I do say so myself. There are 36 pages of text and plenty of colorful paintings illustrating the famous poem. 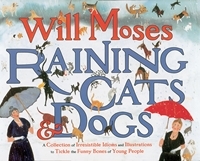 "Will Moses Raining Cats & Dogs"
Are you at the end of your rope trying to find the perfect book for that above average child or grandchild? Well hang on! Here is your chance to take the bull by the horns, make a big splash and get the wonderful new book, Will Moses Raining Cats & Dogs. Children love language and children love art and Raining Cats and Dogs is a highly amusing and delightful combination that is sure to tickle the funny bone of young and old alike. Well, here is a new story by famous American storyteller Jay O'Callahan. This is a story of a young fellow who had the right approach to life, yet none the less suffered misfortune and bad luck at the hands of others and how from the kindness he had once shown a little girl, his life was turned around and his true calling was found. 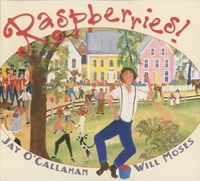 Includes a recording of Jay O'Callahan reading the story. "Will Moses Hansel and Gretel"
11 1/2 " x 9"
This book is, of course, based on the original story by Washington Irving. 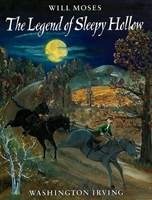 While Irving's original tale is wonderful, it is not something children are likely to read. This version, rewritten and illustrated by Will Moses is in fact a children's book, although, adults seem to be enjoying it equally well. It is profusely illustrated with over 50 original color illustrations each especially created for this story. 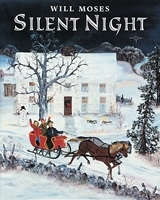 Silent Night, written and illustrated by Will Moses, is for the whole family to enjoy. The story takes place on Christmas Eve, many years ago, away in the hills of Vermont. It is a story about family, friendship, commitment and a very special surprise. Intended for children, this story will warm the hearts of young and old alike. 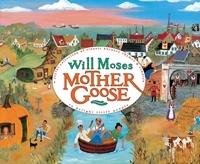 All the well-known Mother Goose rhymes and riddles you know, plus some you don't! 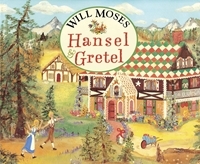 A delightfully illustrated book featuring the unique style of Will Moses with over 55 pages of illustrations and rhymes. One two-page spread features all the rhymes, each with a unique illustration depicting the rhyme - turn the page and there is a two-page painting containing each of the previous pages' illustrations in a complete painting. Imagine the fun children will have finding the rhymes, riddles and characters depicted in each painting. This book is already receiving a lot of great critical comment! You and your little ones are sure to make this a treasured book to be handed down through the generations. Over 55 pages of color illustrations.